Malai Kulfi: Malai Kulfi is a popular frozen dairy dessert from the Indian Subcontinent. It is often described as “traditional Indian Subcontinent ice cream”. 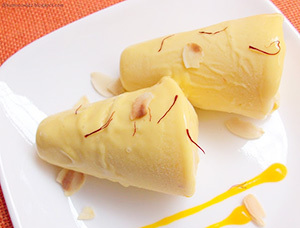 Malai kulfi has similarities to ice cream in appearance and taste; however it is denser and creamier. It is popular throughout places such as India, Pakistan, Bangladesh, Nepal, Burma (Myanmar), and the Middle East and widely available in Indian restaurants in Australia, Europe, East Asia and North America. Add whole milk, condensed milk, and milk powder to a heavy bottomed pan. Add in the saffron and green cardamom powder. Simmer the mixture for 10 minutes, stirring often. Remove from heat and cool till it reached room temperature. Pour mixture into kulfi moulds (4 – 6, depending on size) or any normal mould. Freeze at least 6 hours (Overnight is better). Take moulds out of the freezer 10 minutes before serving. Note: If the malai kulfi is stuck, you can dip the mould in hot water and run a sharp knife along the edges to help release it. Note: You can make the malai kulfi up to 1 week ahead and freeze.